Teach Me Bass Guitar Goes Digital! 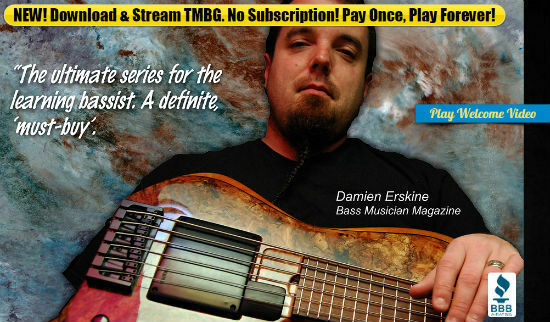 It's hard to believe that almost 4 years ago I put up my first Teach Me Bass Guitar review of the 20 lesson DVD set. After sampling two of the lessons, I listed a bunch of pros and cons and left it up to you to decide if investing in the self-paced bass instruction course was right for you. Having a full DVD set was both an advantage and a drawback for some people. ...but all that went out the window earlier this year when Teach Me Bass Guitar launched the digital version of their popular bass training. Not only did they embrace online bass lessons - they also give you a number of very useful ways to buy and access then as well. One of the key distinctions between Teach Me Bass Guitar and the other options online is that with TMBG you are in fact making a one-time purchase, not an on-going monthly one. So if you don't like monthly jabs at your credit card, you'll be pleased to know that TMBG stayed with the "pay once" format even with their digital lessons. Whether you stream the lessons, or download them to your computer or mobile device - you own it. Period. You can still buy the entire 20 lesson set at once, or you can buy a single lesson at a time - making it more affordable than ever to buy bass lessons from a world-class bass instructor with a Masters Degree in the electric bass (that's Roy Vogt incase you weren't keeping score). Not only that, but you also have the third option of buying your lessons in bundles. The kind folks at The Learning Dock who made Teach Me Bass Guitar decided to create three bundles labelled as "Beginner", "Intermediate" and "Advanced" which group 6-7 lessons at a time. If you decide to spring for the whole set of lessons, you'll only be paying approximately $9.38 per lesson. Bundles cost slightly more per lesson and (as could be expected) if you purchase a single lesson at a time for the full 20 lessons you'll be paying $19.95 each. This is still a steal when you compare it to what most qualified bass instructors are going to charge you for 40 - 120 minutes of bass lessons. What's Different About The Digital Version? The digital version is the same as the original DVD 20 lesson set that was acclaimed for it's high-quality HD camera footage, full view of the fretboard (animated in real time), sit in sessions with live Nashville studio musicians and the original music. The 162 page companion lesson book is included with the digital bass lessons as a PDF that is integrated with the lessons; this means that you won't get the full 162 page PDF if you purchase only one lesson or one of the bundles. You'll only receive the PDF pages relevant to whichever lesson you've purchased. You can print these out if you like, or you can purchase one of the three (Beginner, Intermediate, Advanced) hard-copy books for at $19.95 or all three at a discounted price of $47.88 plus shipping. Last but not least - if you already purchased the full DVD set, you haven't been forgotten. You can get the digital version of those same lessons for a massive discount (rumor has it previous owners get in for about the cost of the spiral-bound lesson book - but you didn't hear that from me!). Here is a summary of what's cool and not quite as cool about the digital version of Teach Me Bass Guitar. No time limit to download - no rush to get these on your computer, download all at once or one at a time. Unlike the DVD set, the digital version of TMBG does not come with a money back guarantee. If you've been on the fence about buying Teach Me Bass Guitar because they didn't have a digital option, you may now rejoice. Also, if you weren't quite able to spring for the $187 sticker price - you now have the option to avoid paying the full cost up front to get access to these lessons. Teach Me Bass Guitar is about the only alternative that I've seen that gives you a real bass education in either DVD or digital streaming/download format. It's a godsend for anyone who wanted lessons but couldn't afford or sync up schedules with or find a reputable and qualified local instructor. There are now fewer obstacles that are keeping you from a top-notch bass education, what's holding you back? Click here to purchase the full digital course at 187.50. When you click one of the links in the article and decide to purchase TMBG from their website, I will receive a commission. Having said that, I only recommend products that I've used or researched personally. I've been recommending Teach Me Bass Guitar since 2011, they have an excellent Better Business Bureau rating and their training is top notch and this is my honest evaluation of their product. The Richest Bass Players in The World - How Many Can You Guess?